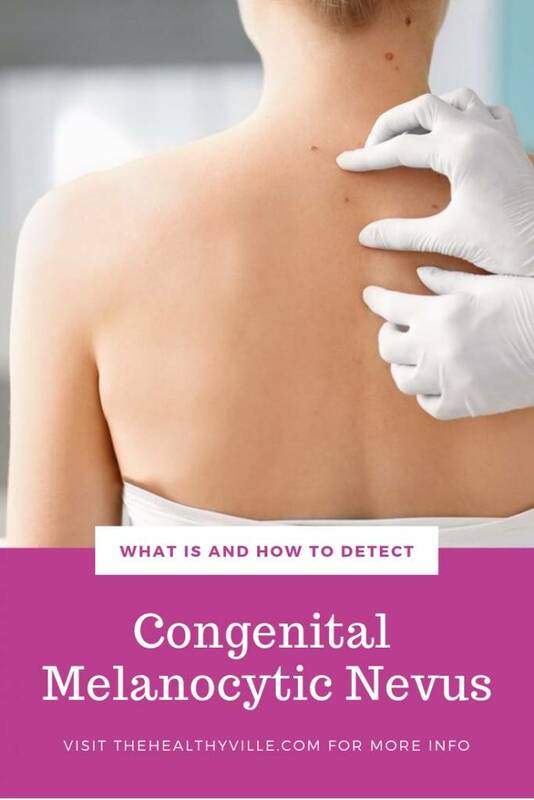 What Is Congenital Melanocytic Nevus and How to Detect It? Home Health What Is Congenital Melanocytic Nevus and How to Detect It? The congenital melanocytic nevus is present in 1% of newborns. Between 5% and 12% of cases, they develop into a melanoma during the first 15 years of life. The congenital melanocytic nevus is a type of mark that is present in some children at birth. It is estimated that this occurs in approximately 1% of live births in the world. The word “nevus” derives from the Latin term “naevus”, which means “birthmark”. With that word a hamartoma is described, that is, a congenital malformation that has a tumor aspect. The congenital melanocytic nevus is just one of the different types of nevi. This type of problem is present from birth, but in many cases it is not detected until after 2 years of age. What is congenital melanocytic nevus syndrome? This “mark” produced in the skin is usually of congenital origin, coming from the accumulation of melanocytes. The congenital melanocytic nevus is defined as an abnormal proliferation of melanocytes, that is, of melanin-producing cells. These cells tend to cluster in nests or theca, which look like a mole. It is almost always a benign process. Those that occur at the time of birth or during the first months of life are the congenital nevi. Typically, they arise between 6 and 12 months after birth and then increase in size and number, until about 25 years. From the clinical point of view, it is not possible to differentiate the congenital melanocytic nevi from the acquired one when the lesions are small. If they have a diameter greater than 1.5 cm, they can be considered congenital. Differentiation is important, because congenital nevi have a greater potential to become melanoma. Nevus of union. It is a flat formation, similar to a dark brown stain, with a homogeneous appearance. Nevos compounds. They have a papular appearance, like a small lump. Its color is lighter than that of the connecting nevi. Intradermal nevi. They also have a papular appearance, but are a bit more bulky than the compounds. They have a very light brown color, or have the same skin color. The most common classification for the congenital melanocytic nevus takes size as a reference point. Those smaller than 1.5 cm in diameter are the small nevi. Medium, between 1.5 and 20 cm. And those who are more than 20 cm are “giants”. Unlike moles, nevi show affectation of other skin structures such as follicles or glands. In the congenital melanocytic nevus the nevus have a small and light-colored appearance, at the time of birth, in most cases. During puberty, it is common for them to take on a dull look. The tone is homogeneous or in tones ranging from brown to black. The edges of small nevi are usually visible, but of medium and large, not so much. Many times these moles have thick, pigmented hairs, from the moment of birth. Others develop those hairs over time. The congenital melanocytic nevus has histological characteristics similar to melanomas. The doctor must perform a dermoscopic exploration to make the differentiation. In general, nevi occupy deeper layers of the dermis and are usually associated with other structures such as hair follicles, subcutaneous fat and sebaceous glands. This type of injury is the result of a mutation of the RAS gene. This gives rise to an early migration of the melanocytes. They appear on fetal skin before day 40 of gestation. The most common is that they occur in the lower back. Read more: Can A Mole Change Color And Not Be Cancer? Find Out All About Mole Changes! In principle, the congenital melanocytic nevus is a benign disease, especially if the nevi are small. Large nevi have an important potential to become melanomas. That is why you should remove them whenever possible. In some cases it is not possible to perform the surgical removal of the nevus, due to its extension and location. The indicated thing in those cases is to opt for a meticulous surveillance every 3 or 6 months. Usually this leads to a surgical resection in stages. According to the available data, the risk of developing a melanoma from the congenital melanocytic nevus is between 5% and 12% in the first 15 years of life. In 50% of these cases, it appears before 3 years of age. In each case the doctor will decide whether to give you surgical or conservative management. Don’t forget to SHARE the symptoms and classification of congenital melanocytic nevus with your friends and family on your social networks!